Eastham - One floor living at its best! We have a 1990 built 3 bedrooms, 2 full baths, upstairs laundry, central A/C, large sunroom, and a 2 car garage on a private half-acre in the Blueberry Banke area of Eastham. Other features are hardwood floors, living room w/fireplace, professional landscaping, kitchen cabinets with pull-out drawers, a new roof, all at the end of a cul-de-sac. Listed at $439,000. Come see! More information and photos can be found at http://9winterberrylane.robertsheldon.com/. Or try a virtual tour...Here. Coast Guard Beach Wins Again! ﻿'Dr. Beach' (a.k.a. 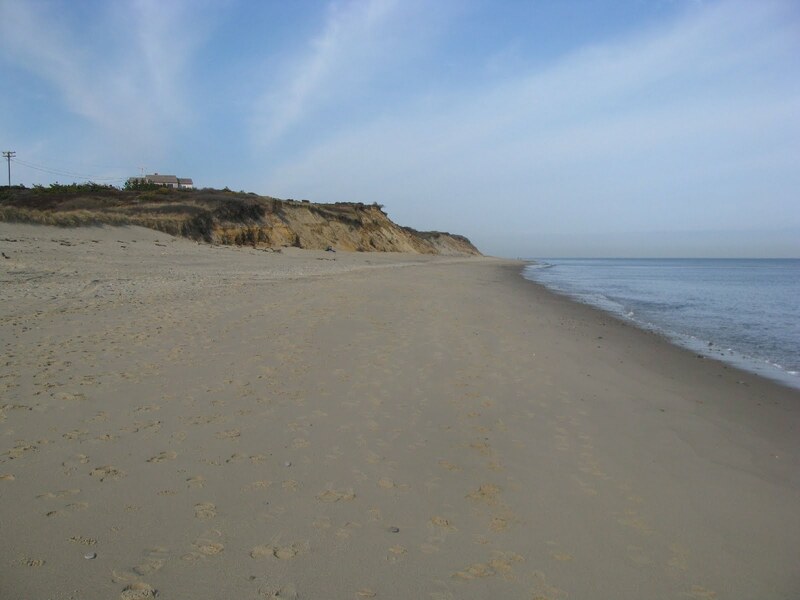 Stephen Leatherman, a professor from Florida International University) has named Eastham's Coast Guard Beach as one of the 'top ten' beaches in the US. Ratings each year are based on a number of criteria, such as sand, water quality, weather, facilities and crowds. Coast Guard came in as number 8 this year. 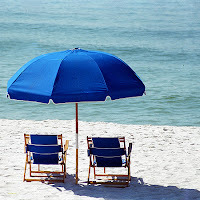 It's no surprise that the number 1 beach (Siesta Key) is from Florida, with beaches from California and Hawaii in the mix. Last week I published the image (right) of a yellow structure that should be fairly familiar to most Eastham folks. It was the Chapel in the Pines, on Samoset Rd. The Chapel, sometimes known as the First Encounter Coffeehouse, sits next to the Eastham library. The Chapel has been a Universalist (now Unitarian-Universalist) Church since it was dedicated in January 1890. Their website, with an extensive history of the Chapel, is here. 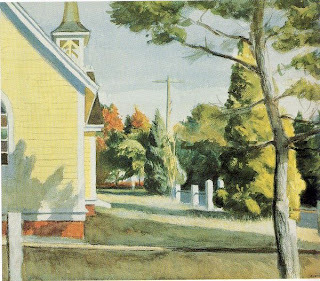 The picture is actually a painting by Edward Hopper, done in 1935, known as "Church in Eastham". It hangs in the Whitney Museum, in New York. 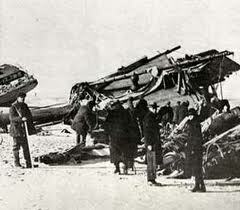 Another large piece of an old shipwreck has 'surfaced' on Orleans' Nauset Beach. It's believed to be a piece of the three masted schooner Montclair that sank in a storm in 1927. Another, larger, piece was unearthed last November just a short distance south from this finding. Unfortunately, there is really no way to be sure which ship this piece is from since there were over 5000 known shipwrecks off Cape Cod. Check out the story and photo gallery on the Cape Codder's website...Here. 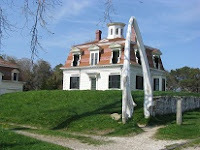 The New York Times "T Magazine" ran a delightful article about the cottage colony on Wellfleet's Chequessett Neck Rd known as the Colony of Wellfleet, or, earlier, the Mayo Hill Colony Club. These cottages were built in 1949 and were used by many famous writers, artists, actors (including Paul Newman), and the elite of the elite. The Colony is just east of the Chequessett Yacht & Country Club. The Colony is a collection of 10 cottages, each of the architecture known as Cape Cod Modern. Check out the article from T Magazine....Here. Tomorrow, May 21st, is the 1st annual Nauset 5K Road Race. The race will start at 9am with a beginning and end point at Nauset Regional High School located at 100 Cable Rd. in Eastham. There will also be a free “Kids Fun Run”. The race is sponsored by the Eastham Elementary School Parents Group and was created to promote health and wellness for both adults and children in our communities. The 5K race route is a mainly flat with one short gradual hill on Meeting House Rd. Check-in will begin at 8:00am and race time is 9:00am. The first 100 registrations will receive a Nauset 5K Race t-shirt sponsored by "The Black Dog" store. Registration closes at 8 PM TODAY. Go HERE to register! My June Eastham Real Estate Newsletter Is Available Now! My June Eastham real estate newsletter is available now! This issue has the results for Eastham through April as well as three new listings. Also, included is an informational document for home Sellers and my "Where in Eastham?" quiz #4. Here is a chart that didn't fit my newsletter. What we see below is that the 'normal' seasonal new listings have appeared. The 'actives', at 101 by mid-May, fall right in line with historical data. Of note, the chart doesn't show that the majority of very recent new listings are in the $400Ks, making for a great selection of mid-priced homes in Eastham. Not actually a photo, but a websnag of a piece of art. This should be an easy one! Where is Eastham is the subject of this painting? Answer next week. ﻿﻿﻿Looking for something a bit different? This is a 4 bedroom antique-style Cape on almost a full acre, in a desirable location. This home is just about 0.2 miles to the Herring Pond beach access and just over a mile to First Encounter Beach. This home has antique rustic charm, great bones, and a cozy 'feel'. New roof & bulkhead. Come see! Go to http://145lawtonrd.robertsheldon.com/ for a more information, map, and a Virtual Tour. The strange white objects are the whale jaw bones that make up the arched entrance to the Captain Penniman House on Fort Hill, off Route 6, just south of the Eastham Chamber of Commerce Information Center. 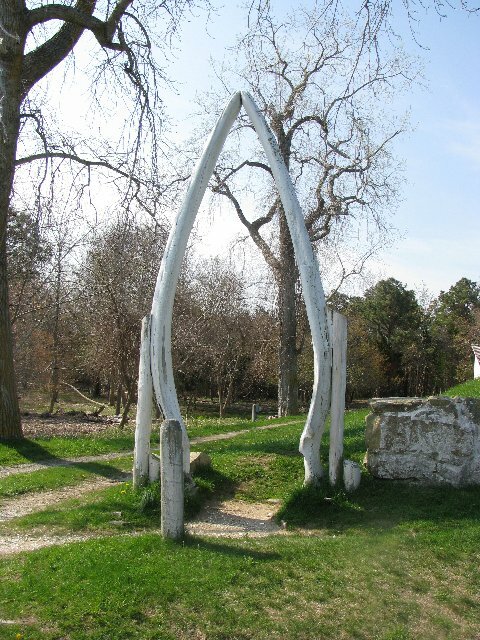 The photo below should give you a better idea of where the jawbones are. Certainly buyers with cash, vs a mortgage, have always had somewhat of an edge when negotiating with property sellers. This is particularly true for second and investment homes. 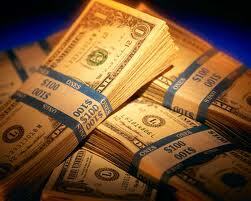 The current difficult mortgage environment makes cash deals even more desirable. Why would a seller want to risk having their offer fall through due to the buyers' inability to secure a mortgage? SmartMoney magazine has a very interesting article in the June, 2011, issue on why cash is especially important in purchasing 2nd homes. This article is on the SmartMoney.com website... here. CNBC's website ran an article about the 'long road' to recovery of the nations' vacation home marketplace. Since a vacation home is the definition of a discretionary expense, only those who have the extra cash, and feel confident spending it, are in the market for a second or vacation home. 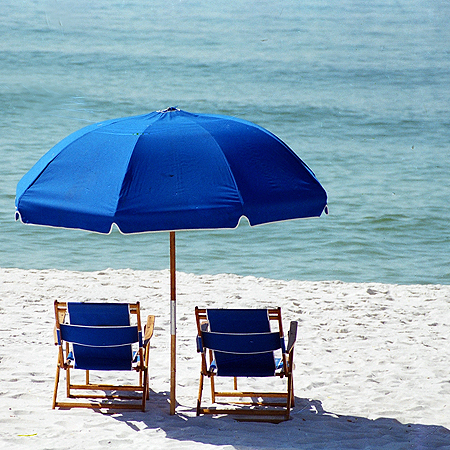 Nationally, many vacation areas are hurting when it comes to sales volume and home prices. Interestingly, Cape Cod is cited as a 'bright' spot in the otherwise struggling vacation home marketplace. Check out the article on CNBC.com.....Here. From Sandwich to Provincetown there are lots of culinary resources worth exploring. Restaurant Week on Cape Cod has been at bi-annual event since late 2009. The 3 - 4 course prix fixe theme, with pricing set from $25 - 35 per person chosen by each location, has remained consistent throughout the event's history. Check out the Restaurant Week website for a list of participating restaurants and to find info on the wide variety of fine places sure to tantalize your palate. 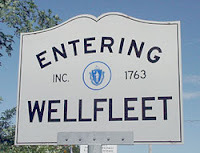 There are quite a few in Provincetown, with others in Wellfleet, Orleans, and Brewster. This is a great opportunity to take advantage of amazing values with special fixed price menus and to find some new favorite restaurants that you may have missed. Come eat! Eastham - You need to check out this pristine 3 bedroom, 2 bath, contemporary Captain's Cape, with vaulted ceilings, skylights, and an open floorplan. This home has been completely updated with new window treatments, new roof, new exterior lighting, new wall-to-wall carpeting in the bedrooms, new sliders, storm doors, ceiling fan, skylight shades, new stove and fridge. Add to this hardwood floors, fresh paint, an updated fireplace, first floor laundry, a full dry basement, large rear deck, attached garage, and professional landscaping. The result is a restful retreat just a short distance to the National Seashore's Nauset Light Beach. Can be purchased fully furnished - just bring your bathing suit! Listed at $489,000. Go to http://45lighthouselane.robertsheldon.com/ for more information and photos. Go see the Virtual Tour. It's that time of year again. The herring are running at the many herring runs, including the run at the Brewster Mill, on Stony Brook Rd. Check out this video, from the Cape Cod Times. Over the last couple of years a few of our visiting sharks have had the 'opportunity' to be tagged with GPS tags so they could be tracked by marine scientists. These scientists now have a fair idea how these sharks migrate north and south, seasonally. 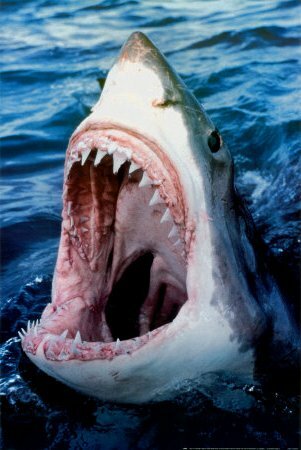 They predict that this year is likely to be a very busy shark year, particularly near where the seals live and play. Check out the article (and video) in the Cape Codder. The 2010 census has determined that the majority of the Outer Cape's homes are seasonal. Overall, Cape Cod's seasonal housing comprises only 35.5% of the total, ranging from 13.6% in Sandwich to over 64% in Truro. The Outer Cape is almost entirely over 50%, where the Mid and Upper Cape are generally under 50%. Of note, the US Census Bureau's information shows that the seasonal home percentage (in Eastham as well as Cape-wide) is up 3.5% from the 2000 census. Eastham is up from 52.3% (2000) to 55.8% (2010). Check out the graphic, below. Wellfleet Bay Birds and Seals - Oh My! 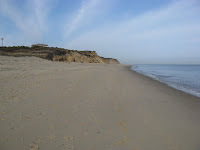 I found this blog entry that has a few amazing photos take of Gray and harbor seals on the sands of Wellfleet Bay. I didn't think seals were present on the Bayside sands in such numbers. Hmmm. Check out the photos.... Here. I took this photo this morning somewhere in Eastham. This location is traveled by folks coming to Eastham to enjoy the many vistas. Where is this? And, what are they? I'll publish the answer next week. Eastham - First time on the market - this immaculate home is a 4 bedroom, 2 bath Captain's Cape has been lovingly maintained. We have an open floorplan with a large kitchen/dining area, and a living room w/fireplace. We also have underground utilities (including natural gas), a new roof, 2 car detached garage, an outdoor shower, and a full basement. The property is nicely landscaped and in a quiet neighborhood of beautiful homes. To be sold fully furnished. Price to sell at $429,000. For more photos, a Virtual Tour and more info, go to http://40serbst.robertsheldon.com/. Come see! There were 7 homes sold in Eastham in April, the same as March. The median sale price in April was $388K. There are currently 95 active single family listings in Eastham, with an average list price of $540K and a medium price of $439K. The average days-on-market is currently 235 days.